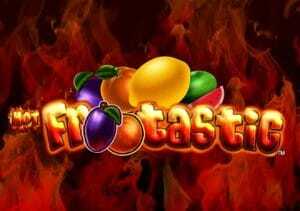 If you’re looking for a video slot that harks back to the early days of the fruit machine, then look no further than Hot Frootastic. It’s a 5 reel, 10 payline game from Barcrest where all of the action comes in the base game. Play on your PC, tablet or mobile from between 10p and £500 per spin. There’s nothing complex about Hot Frootastic. That’s true of both the design and the gameplay. With shooting flames in the background, you’ll see a plain black reel set where you’ll find 7 different symbols. At the bottom of the payout food chain are the cherries, lemons, oranges and plums. All 4 of these symbols deliver payouts of 2, 5 or 20 times your bet for a 3, 4 or 5-symbol combination. Potentially more rewarding are the bells and melons. Land 3, 4 or 5 of these on a payline and you’ll pocket a payout of 5, 20 or 50 times your bet. Top of the pops as far as payouts go is the golden lucky 7. This will get you a payout of 10, 100 or 500 times your bet if you land 3, 4 or 5 in a row. The base game can deliver some decent action and payouts which is just as well given that there are no bonus features on offer here. Everything revolves around the base game in Hot Frootastic. There aren’t even any wilds here, let alone a scatter that might trigger a feature. If all that sounds a little on the repetitive side, then you’d be right. If you like video slots with plenty of extras, then we’d point you in the direction of Blueprint Gaming and the like. Many video slots from Barcrest are stripped back on the features front but this takes it to its extreme. There’s not much more to say about Hot Frootastic. The variance is in the medium range and the RTP is a click under 96%. Saying that, you can win 5,000 times your bet if you fill the reels with the golden lucky 7 symbol. If you like simple, old school action, then that’s exactly what’s on offer from Hot Frootastic.